1.1 GENDER - words importing the singular include the plural and vice versa, and importing a gender include other genders. 1.2 JOINT AND SEVERAL - If there is more than one Renter, any liability imposed on the Renter by this Agreement shall bind them jointly and each of them severally. 1.3 SEVERANCE - Where any provision of this Agreement is rendered void or unenforceable by operation of the law, such unenforceability will not affect the enforceability of the remaining provisions. 1.4 The 'VEHICLE' means the Vehicle &/or trailer supplied to Renter by the Owner pursuant to this and any follow on Agreement whether it be the Vehicle named in this Agreement or a substitute, together with all accessories thereto - the term 'car' excludes 4WD's. 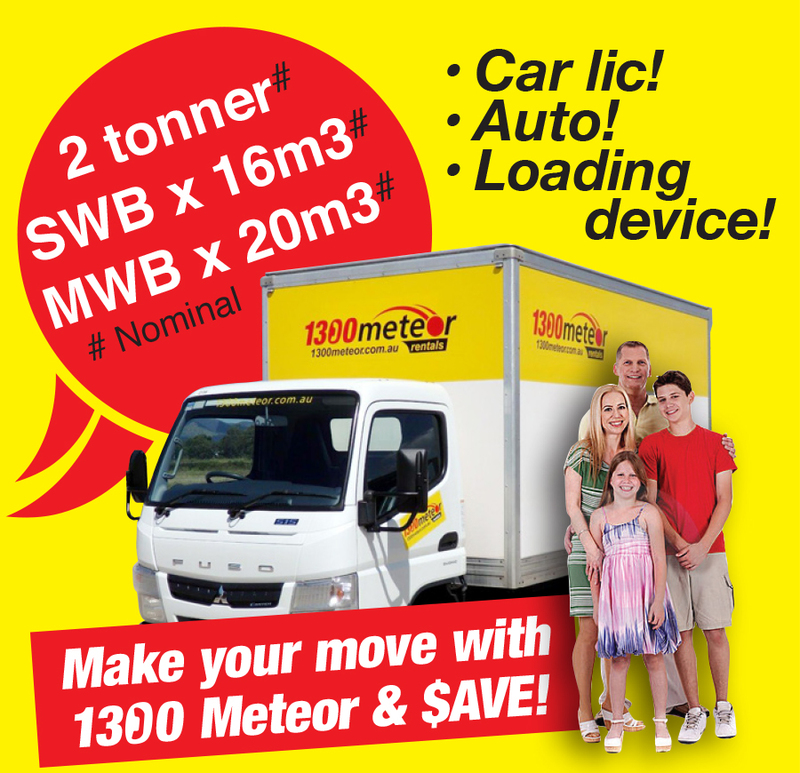 1.5 The 'OWNER' means Addison (NQ) P/L ABN 51 009 827 730 & Addison (Aust) P/L ABN 38 631 194 440 trading as '1300 Meteor Rentals', and its licensees & agents. 1.6 The 'RENTER' means the persons, natural or corporate, listed on the face hereof to be the Renter or Joint Renter, and includes any person who signs on the face hereof as or on behalf of the Renter or Joint Renter, and notwithstanding that the person who signs is merely the servant or agent of the Renter or Joint Renter. 1.7 'WRITTEN NOTICE' includes notice sent via text message/SMS, email or letter. 1.8 'DAILY RATE' means the daily rental rate payable by the Renter to the Owner for rent of the Vehicle and shown on the face of this Agreement. 1.9 'SEALED ROADS' means a road with a hard, smooth surface of tarmac, concrete, etc except in the case of unsealed detours to accommodate roadworks to gazetted sealed roads provided by government bodies and/or their contractors. 1.10 'AUTHORISED AREA OF USE' means the 'local use' of the Vehicle within a 200km radius of the depot from which the Vehicle was supplied unless noted otherwise to the face of the Agreement. (iii) all costs and expenses of any claims, actions, suits or proceedings arising as a result of loss or damage set out in (i) or (ii) above and all consequential loss to the Owner including loss of rental income. (g) 'Claimable Vehicle accident' is a 'Single Vehicle accident' or 'Multi Vehicle accident'. (iii) for all other Vehicle types hold a current open driver's licence valid in the place of hire and for the class of Vehicle hired. (h) not use the Vehicle outside the Authorised Area of Use indicated on the face hereof. If in the opinion of the Owner the Vehicle has been used outside the Authorised Area of Use the Renter shall pay an increased rental rate determined by the Owner as being commensurate with the usage of the Vehicle. (c) in a clean and tidy condition. 3.3 In the event of the Vehicle breaking down or being rendered inoperable and/or unsafe as a result of an accident or any other reason, and where circumstances fall outside of any emergency breakdown service provided by the Owner through the R.A.C.Q. or any other provider, the Renter shall arrange at his own expense to return the Vehicle to the Owner forthwith. The period of rental shall be determined upon such return of the Vehicle to the Owner, by the Owner. In no event shall the Owner be responsible for any expenditure and/or loss incurred by Renter arising out of any breakdown or failure to the Vehicle for any reason whatsoever except to the extent it has been caused by the gross negligence of the Owner. (b) If the Owner suspects that the Vehicle may have been damaged or may have caused third party damage. (b) if clause 4.2(a) does not apply, the Owner is entitled to enter any place where the Vehicle is situated or where the Owner suspects the Vehicle may be located and repossess the Vehicle without being liable for doing so and the Renter agrees to indemnify the Owner in respect of any claim, action, suit or demand arising out of such actions. 4.4 Provided that the Renter is not in breach of this Agreement the Renter is entitled to terminate this Agreement if the Owner breaches this Agreement. 5.2 Where servicing of the Vehicle forms part of the Renter's contractual obligation as per a written Quote supplied by the Owner and agreed to by the Renter, the Renter must: arrange to have the Vehicle serviced, in accordance with the log book by a licensed and reputable mechanic; ensure that the Vehicles' servicing log book has been completed. (b) deliver the Vehicle to the Owner's depot or their nominated service agent for servicing when due. 5.4 The onus is on the Renter to notify the Owner of scheduled servicing and/or arrange for the Vehicle to be serviced in accordance with the vehicle's log book. (c) A penalty equivalent to 10% of the Vehicle's current market value where one or more scheduled services have not been entered into the Vehicle's log book by a qualified mechanic during the rental period, thereby jeopardizing the Vehicle's manufacturer's warranty and/or resale value. 5.6 Freight costs to servicing & / or maintenance supplies or any other supplies forwarded to & / or returned by the Renter are to the Renter's account. 6.3 Loss of rental income charges shall be calculated thus: (Total days inoperable x average utilisation rate applicable to the class of Vehicle for the month in which the accident occurred) x (a stand down rate representing 70% of the daily rate applicable to the duration of hire and exclusive of 'free km' allowances). (d) all loss of income from rental of the Vehicle whilst it is being repaired or replaced. (iii) if the Vehicle is fitted with a crane - up to a maximum of $5,500.00 for any damage arising from the use thereof. (ii) The penalties set out in clause 5.5 (a) & (b) (if applicable). (c) the Renter has supplied the Owner with the name of the insurer of any third party. (c) any surplus amount where the amount of LDC paid by the Renter exceeds the final cost of loss, damage and recovery. 7.5 Any refund of your Liability payment in part or in full will be contingent upon the outcome and in making a refund pursuant to clause 7.4 the Owner may take into account all costs incurred in connection with the loss and damage and recovery including administrative costs and legal costs on a solicitor and own client basis. A minimum incident/Accident Administration Fee of $350.00 per claim applies. 7.6 If the Renter is required to pay the costs of loss &/or damage pursuant to clause 7.2 (b) then the Renter must pay to the Owner all amounts payable in accordance with clause 7.2 (b), whether or not the repairs have been actually completed at the time of the Owner raising the account. (o) if Renter declines our LDC please refer to Clause 6 of our rental T&C's. (d) any breach of this Agreement by any person including by any authorised or unauthorised driver of the vehicle. 8.3 The Renter warrants that before they commenced using the Vehicle the Renter fully examined same and by such examination or by whatever other means satisfied himself as to the quality and fitness for the purpose for which the Vehicle is required by the Renter. If in any way the Vehicle is defective or unsuitable for Renter it must be returned immediately to the Owner with written details of such defects or unsuitability and upon such return to the Owner the period of rental be determined. Renter acknowledges that the Renter in no way relies upon the skill or judgement of any representations made by or on behalf of the Owner in respect to the Vehicle or its performance. (e) will report such incident to police as is required by law and/or at the direction of the Owner. 9.2 Renter must at the request and cost of the Owner do and concur in doing and permitting to be done in the name of Renter or any person on whose behalf Renter has entered into the within agreement all things as are necessary or reasonably required by the Owner for the purpose of enforcing any rights, or obtaining relief or indemnity from other parties in respect of any loss or damage to or in connection with the Vehicle. 10. WINDSCREEN, HEADLIGHT & PUNCTURE REPAIR COVER (WHC) (only applies if selected). 10.3 If the Vehicle is a car or mini-bus (up to 12 seat capacity) the Renter will not be charged for puncture repairs where usage is confined exclusively to sealed roads if the Renter has purchased WHC. 11. PPSA Law 'PPSA' means the Personal Securities Act 2009 (Commonwealth) as amended. 11.5 If the Renter fails to comply with clause 11.4 and the Owner loses title to or possession of the Vehicle then the Renter agrees to reimburse the Owner for the cost of Vehicle along with any costs incurred by the Owner in attempting to regain possession or control of the Vehicle. (c) a statement under section 142 of the PPSA (redemption of collateral). The meaning of the terms Grantor, perfect, security interest & control are as stated to the PPSA. (a) all charges specified on the face hereof: all distance charges are to be measured by using the Vehicle's odometer. (f) interest at the rate of 10% per annum calculated on a daily basis, on all overdue monies owing under this Agreement interest will only be applied to holders of a current credit account after 45 days overdue, backdated to the due date . 13.5 Pursuant to s11(2) of the Electronic Transactions (Qld) Act 2001, the parties agree to receive the Terms and Conditions and any Credit Card/Collecting driver Authorisation Form by electronic means and provide information by electronic means if requested and the parties agree that any email versions of the signed and scanned documents shall be binding as if the original copies had been signed by the parties. 1. Interpretation: 'We', 'us' and 'our' refers to Addison (NQ) P/L & Addison (Aust) P/L trading as 1300 Meteor Rentals. 'You' and 'your' refers to the Renter. 'T&C's' means our rental Terms & Conditions. (i) a Bond of $1,000.00 for 4WD's and $250.00 for all other vehicle types (per Vehicle), via a pre-authorisation on your Credit card or bank issued Visa and MasterCard Debit cards with a credit facility and displaying a card number and your name. Cash, Travel cards and Eftpos cards are not accepted. A credit card authorisation is not a charge but holds or secures an amount on your credit card (limiting the funds available), allowing us access to the funds in the event additional amounts need to be charged such as damage liability, rental extension or fuel charges. Pre-authorisations are not able to be cancelled by us but are automatically cancelled by your card provider between 14-28 days if not used by us. The card used has to be in the same name as the main driver picking up the Vehicle who must be present. 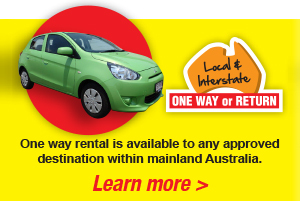 (ii) the estimated rental, inclusive of all fees and charges payable by cash, charge and debit cards and Travel Cards. (ii) an Additional Driver Fee (ADF) fee (2 or more drivers) of $11 per driver (once off charge) applies - Renters meeting the provisions of T&C Clause 2.1(d)(ii) are exempt. (iii) a Young Driver Fee (YDF) of $9/day is applicable to drivers in the 21-24YO age group; Renters meeting the provisions of T&C Clause 2.1(d)(ii) are exempt. 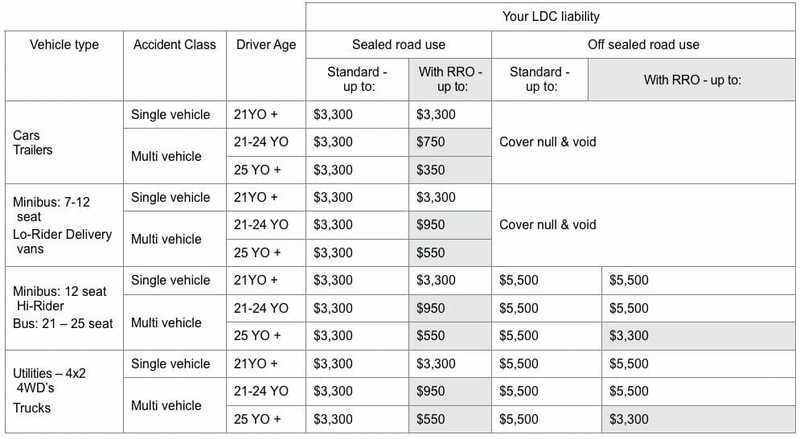 (iv) Provisional Driver Fee (PDF): Drivers with a Provisional licence and have held same for a minimum of 12mths are welcome to rent our 4x2 cars (and no other) - a fee of $20/day or $280/mth applies - Renters meeting the provisions of T&C Clause 2.1(d)(ii) are exempt. 4. Rental periods: Quoted 'half' day rate covers 4Hrs, 'overnight' 4.45pm 7.45am, 'daily' rate 24 Hrs late returns will be charged at 1/5 of daily rate per Hr, in 1/2 Hr increments. 5. Rental extensions: If seeking to extend the rental you must advise us IN ADVANCE of the agreed date and time of return otherwise the Vehicle risks being reported stolen if overdue extensions are subject to vehicle availability and prepayment of additional rental. 7. Checks before moving off: We ask you to check and accept responsibility for all installation/connections BEFORE moving off, including to BABY SEATS and to TRAILER CONNECTIONS. We do not accept responsibility for incorrect fitting / coupling. temperature gauges may not work when coolant is lost. 9.1 Standard Loss or Damage Liability (LDL): Our rates include LDC, for damage incurred as the result of a vehicle accident with the standard liability amounts representing the amount payable by you in the event of loss or damage to the Vehicle &/or a third party vehicle &/or property, even if you believe you are not at fault (refer to Clause 9.3 (v) below). Your Liability appears in the table to 9.2 (under 'Std'). (vi) If you are involved in an accident and believe you are not at fault we will endeavour to recover all costs from the other party any refund of your Liability payment in part or in full will be contingent upon the outcome. A minimum Incident/Accident Administration Fee of $350.00 per claim applies which takes into account the time it takes our administration staff and office to compile all information necessary to submit a claim with our insurer and then follow that claim through to completion. 11. Insuring your property: LDC covers our Vehicle only - You are responsible for providing insurance cover over your property &/or goods being carried. 12. Vehicle breakdowns / break-ins: Personal losses &/or expenditure incurred as a result of break-in are your responsibility. Loss of profits, time lost, replacement vehicle costs & liquidated damages are not recoverable from us in the event of vehicle breakdown. 13. Rental Agreement finalisations (and refunds) are subject to a minimum 24 HRS CHECK-IN and INSPECTION PERIOD (weekdays, excluding public holidays). 14. Fuel: Topping up of fuel &/or AdBlue upon return is to your account, at cost + a $20 service fee. If topping up before return please do so at the nearest service station to our premises, and ensure that you fill to the brim to avoid a topping up charge. 15. Tyre damage (pro-rata) &/or puncture repairs not covered by WHO (if taken advantage of) are to your account. A minimum fee of $50 applies. 16. Cleaning charges: A cleaning charge will be applied to vehicles returned unduly dirty or soiled. 17. Authorising of repairs to our Vehicle: We will only reimburse cost of repairs AUTHORISED by us (receipts are required). 18. Fines & violations: You are responsible for parking fines and traffic violations - a $35 service fee applies. 19. Tolls: Toll charges are your responsibility and will be passed onto you. A service fee does not apply. 20. PPSA: Business/company rentals for 90 days+ will be entered onto the PPSA register (and removed after return) a $35 service fee per transaction applies. 21. Roadside assistance: Included however service fees for lockouts, tows if bogged or stuck, fitting of spare wheels, empty fuel, flattened battery, or if you leave before help arrives are to your account. (ii) The total of the invoice is subject to a 5% Administration fee.